me and my 2 guys: My Peppermint and a spooky coincidence! The very kind Rosie from Melly and Me has made up my Peppermint - in my choice of colour - Orange. Now I know orange is weird and not very Pepperminty but I'm just not a pink person and I have a son. So I chose orange. You can see my very own Peppermint on Rosie's blog. Now the weird coincidence comes into it when you read the rest of Rosie's post and hear about her friend's new dog called Yuki. 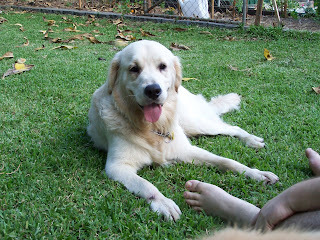 Those of you who have read my first couple of posts will remember that I have a dog called Yuki as well. HOW STRANGE IS THAT? Now my Yuki is short for Hiroyuki Sakai from Iron Chef, but I do happen to know that in Japanese it means white or light - which fits our Yuki well also as he is a blonde Golden Retriever. Anyway here is a pic of my Yuki and I will post some photos of my Peppermint chilling in her new digs when she arrives. Thanks again Melly and Rosie. I saw your Peppermint this afternoon on Rosie's blog - lucky you! Congrats - how excitement! I LOVE Melly and Me. I bid on and won Acute in their Bushfire Appeal Auction. He's my fave Melly & Me softie and it is so fab to have something made by them. How special to have a softie made by them especially for you!!! I can't wait to see a photo of your "Peppermint" helping you sew.